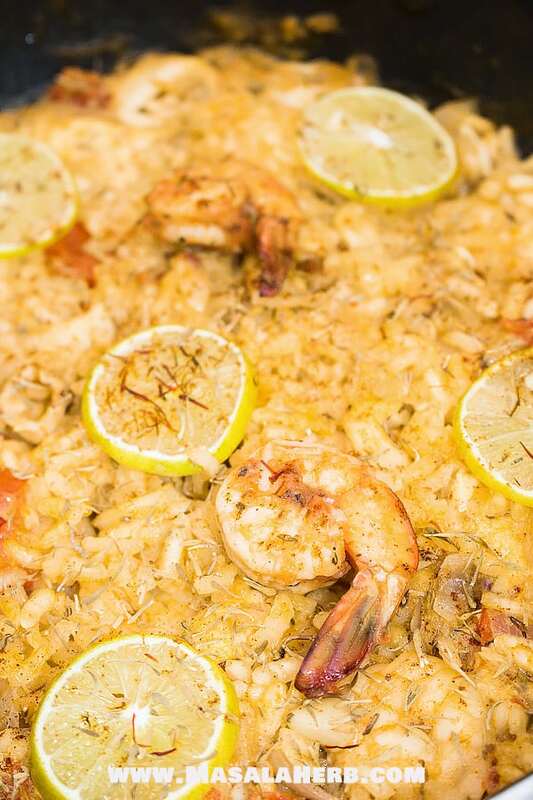 Spanish Paella Recipe, loaded with seafood and gorgeous flavors. This popular rice one-pot wonder dish includes seafood, chicken, spices and is easily prepared from scratch without much effort. Spanish Paella is a well-known dish all over the world. 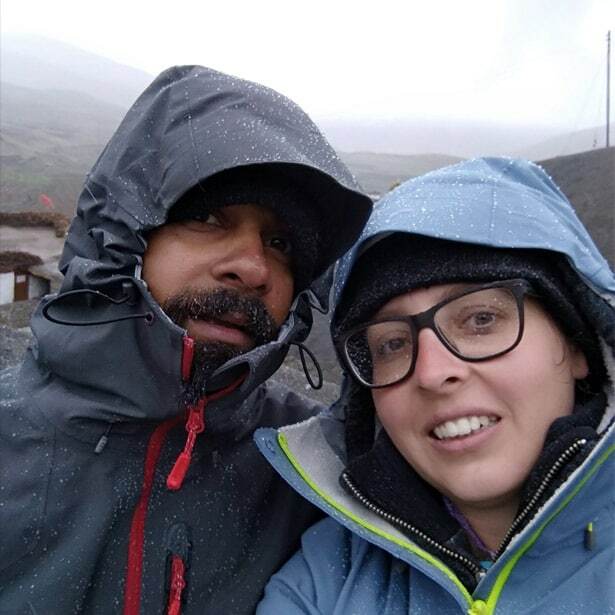 If you have traveled to Spain or if you were invited to a homemade Spanish dinner prepared by a Spanish friend than you got to try cooking up your own homemade Spanish paella! Our Spanish/Catalan friends from Barcelona got me hooked on their Spanish paella recipe. It’s a well-balanced meal with rice, meat and fresh seafood. You are going to love it! 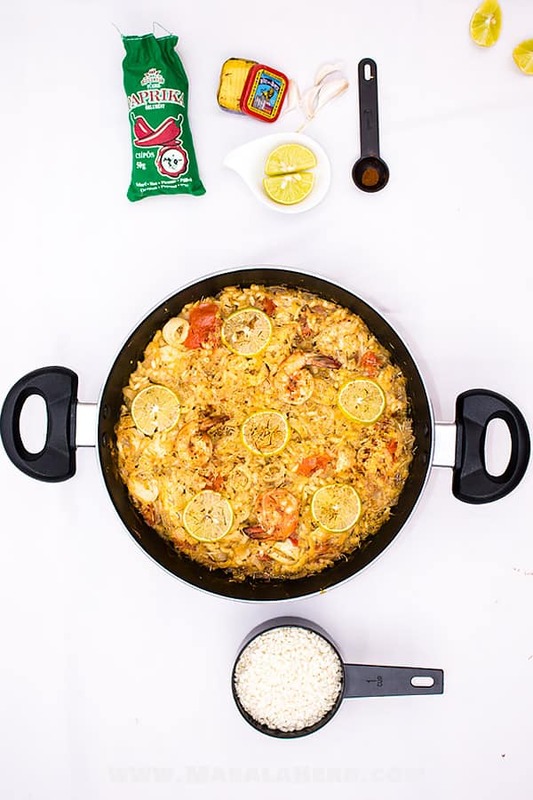 Spanish Paella is a one-pan dish with rice and different non-veg proteins. Saffron is the main spice, turning the dish yellow. There are different Spanish paella variations. The way a paella is prepared or the ingredients it calls for depends on the region, particular place and sometimes on the family or neighborhood. Paella is a dish that exists most probably since the 18th. Spanish Paella is often while associated with the rice growing neighborhood of Valencia situated in the southeastern coast of Spain. Valencia Paella is considered to be the mother of all Paellas! What is in a Paella? Paella is prepared with short/medium grain rice. This type of rice takes in the flavors of the ingredients & broth to the rice grain core. A Paella tastes amazing when the flavors of the other ingredients get absorbed by the rice grain like a sponge. So picking the right rice variety is an essential step for a successful spanish paella! Rice from the Spanish regions does exactly that and should be picked above other rice varieties to prepare paella if possible. Spanish rice has been cultivated since Roman times and the grain irrigation and final grain traits where perfected by the Arab Moors. What is the best rice to use for paella? Bomba rice (often while referred to as Paella Rice) is the preferred choice to prepare any Paella dish as it absorbs the broth flavors well. It’s also hard to overcook bomba rice, making it the most perfect Spanish rice variety to use for Paella. Try to use Bomba rice, which is the local Spanish rice variety. It’s hard to get by this Spanish paella rice and it’s not cheap but well worth it for this particular one-pot dish. Valencia medium grain rice is another great option but the rice grains are more tricky. Use Valencia rice for paella if you are an experienced cook as the liquids used need to be carefully adjusted to not overcook the dish. Otherwise, you can use other medium/short grain rice variations such as the common Arborio rice (aka risotto rice) or the Japanese short grain sushi rice. It’s not perfect, but Spanish people say it’s ok to use Arborio rice. The problem with Arborio rice is that it gets creamy like a risotto is supposed to be. A paella, on the other hand, is not a creamy dish but individual rice grains with absorbed liquid. I think Arborio rice or Japanese short grain rice can be used well in a Spanish paella recipe if the rice is washed a couple of times before added to the cooking process. So, you wash the rice around 8 times until the water comes clear, that gets rid of the extra starch which makes the rice either sticky or creamy. Basmati or other indicia long grain rice varieties are taboo and should not be used for Paella. To be honest getting Spanish rice, like the Bomba or Valencia variety, is not easy, so I use Arborio rice and it is OK to use it. Spanish folks have confirmed it! Not the best solution but better than any other non-Spanish rice variety. Originally the Valencia Paella would include local ingredients, besides the rice, such as seafood (clams, mussels, shrimp, calamari), chicken, rabbit, local white beans, artichokes, and even snails. Basically, Spanish paella is actually a very flexible one-pot rice dish, which is good news for us! Wo what can YOU add to your Spanish Paella Recipe? You can add rabbits or snails if you want, however, these ingredients are not always favorites in most people’s books. The absolute main seasoning ingredient in any Spanish paella recipe is Spanish Saffron. These expensive flower threads should not be mixed up with turmeric (Curcuma powder) because these are two different things. Saffron threads are part of the crocus flower buds, turmeric is a root spice. Both have different flavors. Saffron gives the Paella rice a hard to describe flavor which I believe is important. You can’t really use Turmeric just for the sake of making the paella yellow. In that case, you would be better off staying away from the turmeric and just working without the saffron because the turmeric gives the paella a very Indian flavor and that’s not what we are looking for when we prepare a Spanish dish. If you want to make a one-pot rice dish with turmeric than you can make this chicken and rice meal. BUT try to not omit the Saffron, it just makes the paella dish such a better meal. I feel a paella without saffron threads is almost a crime. 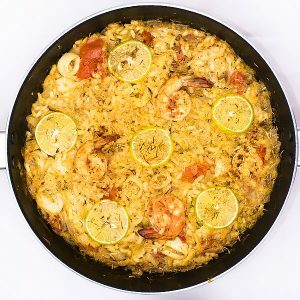 How to make Spanish Paella? To make Spanish Paella from scratch is easy. That’s why Paella makes a great weeknight dinner meal. You can also meal prep the Spanish Paella recipe to take the meal to work or school. Best is if you keep all your ingredients ready. You will need an onion, tomato so cut it small and keep the proteins/meats you would like to add at the side ready. Start by heating up the pan and pouring some olive oil into it. Fry your onion soft and then add the cut tomato, seasoning, broth, saffron, and rice. You could toast the rice first to bring out the aroma. I omit this step because I am usually in a hurry and tend to forget to do this. Once you have added the rice, you should only stir the whole content once. The more you mix and stir the more starch is released and we want to avoid that because the starch makes it mushier. Then continue to add the garlic and proteins. I like to add shrimp, squids, and chicken. The last step is to just let the whole content cook on low heat (after having stirred the whole content with the proteins once!). Until the Spanish paella rice is cooked through but not too soft and until the liquids are all soaked up by the rice. The aim should be to have a slight rice crust at the bottom of the paella. You achieve that better with a steel paella pan. Why is it called Paella? Paella comes from “La Paella” which refers to the Spanish cooking pan known as a Paella pan. Paella most probably comes from the Latin patella which simply means pan. To compare, in french pan means poêle, so there is a latin language connection for the word Paella. What’s a Spanish Paella Pan? A Paella pan is a very large deeper shallow pan mostly made of cast iron or carbon steel. Spanish paella is traditionally prepared in this special paella pan. Now you don’t need to go out and buy this special pan but a paella pan can come handy in some ways to prepare other dishes. The paella cooking pan can do something that no other shallow pan can achieve to a paella. You see a Paella is cooked without stirring the dish and that is so that a brown crust is formed at the bottom of the pan. According to my experience, you almost need a paella pan to achieve that brown rice crust. The crust even has a name, socarrat. I personally love that crust in a paella as it adds some texture to the bottom of the dish. But if you don’t have a paella pan on hand right now to make this delicious Spanish paella recipe then just grab any large shallow pan that you have and get cooking! 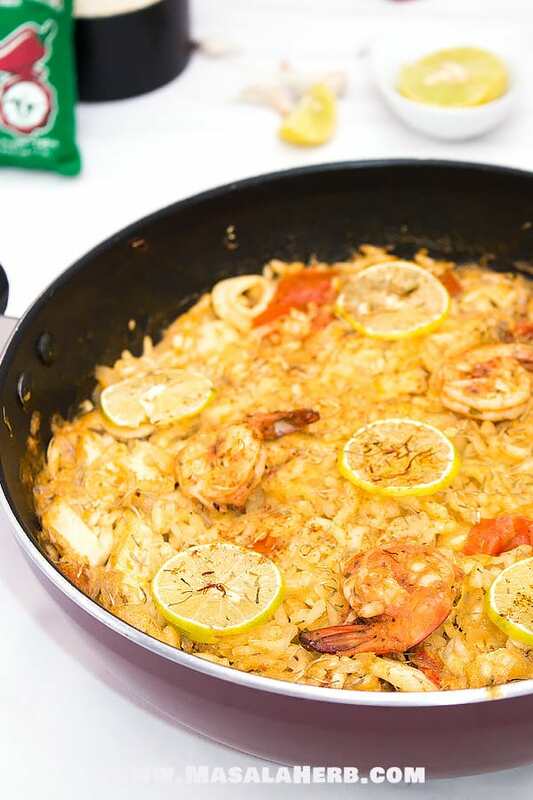 This Spanish Paella includes seafood such as shrimp and squids, as well as chicken and saffron to add the lovely yellow color and flavor we love. Prepare this one-pot dish as a quick and easy meal during the week for dinner or add it to your meal prep lunch meals to take to work or school. See my advice about what rice to use in the post above. You can be flexible with the proteins too, see for more info about the choice of ingredients in the post. Next up are the spices, add the Paprika and thyme and just stir fry for a few seconds with the rest of the pan content. At this point, you can add your broth. and saffron threads. Then pour in the short grain rice. Try to avoid stirring until you have added all the ingredients. Season with salt. Now you can add the squid, shrimp, and chicken and mix the whole content well. After that do not mix anymore, this part is important! The more you mix the more blurry mushy the Spanish paella will get. Cook until all the liquids have been absorbed and the rice is cooked. Ideally, you should have a slight crust at the bottom of your pan. That crust has a special place in a paella lovers heart. Use short grain rice such as Bomba rice or Valencia rice (paella rice) if you can. In case you can also use other short grain rice types such as arborio or even the Japanese sushi rice but then make sure to wash the rice at least 8 times until the water is completely clear. See in the post for more details. The Recipe is flexible: You can pick what proteins and seasoning you want to add. You can also opt for clams mussels, beans, peas, and rabbit etc. Once you have added the rice, only stir the content once if possible because the more you stir the mushier the rice will get we want to avoid the starch from moving around in the dish. Try to use a paella pan if you have for the best result. The crust at the bottom of a paella makes a great paella! Dear Reader, where did you taste your first Spanish Paella Recipe? Please feel free to share with us your experience and thoughts further below in the comment section! These are such great paella tips- thank you! Oh girl. I have been wanting to make a seafood paella for AGES now. Somehow, I keep forgetting. (Whyyyyyy.) This is a delicious reminder of why I should get on that stat! For me it is the ultimate comfort food (sorry pasta) rice that is packed with flavour and so easy to eat. Your paella looks fantastic. Perfect for entertaining too. Ahh..Paella one of the perfect dish to satisfy an empty stomach, and we’re lucky, this dish is available at our favorite restaurant. My family enjoys paella because of the tender clams or mussels, and smoky chorizo simmered in savory saffron rice. Yum!! 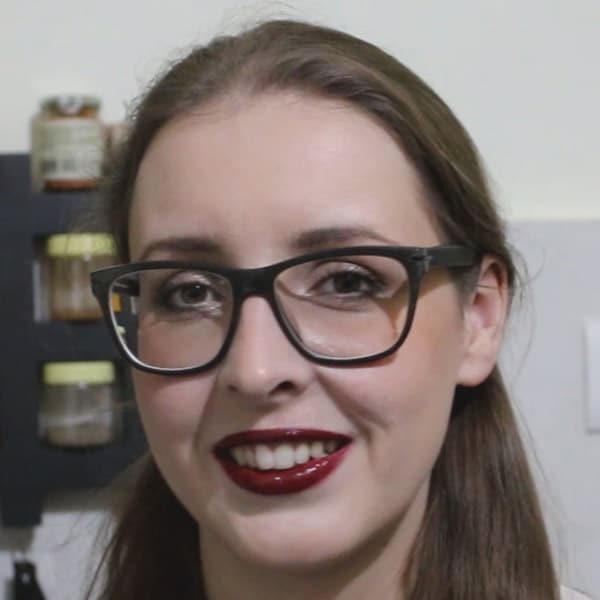 Hi, this may be interesting you: Easy Spanish Paella Recipe with Seafood [+Video]!